As the NCAA men’s basketball tournament drew to a close on April 6, with the Duke Blue Devils emerging victorious from the Final Four for the second time in six years, an average of 23.8 million viewers watched on their televisions. March Madness itself drew a higher average viewership than it has in 22 years. Indeed, college basketball is enjoying an enormous amount of popularity. Yet the women’s championship game last week, in which UConn defeated Notre Dame 63-53 to assert its continued dominance in the women’s sport, went relatively unnoticed. “One is a sport, and one is a joke,” the character Dwight Schrute once said on The Office about the NBA and the WNBA, respectively. 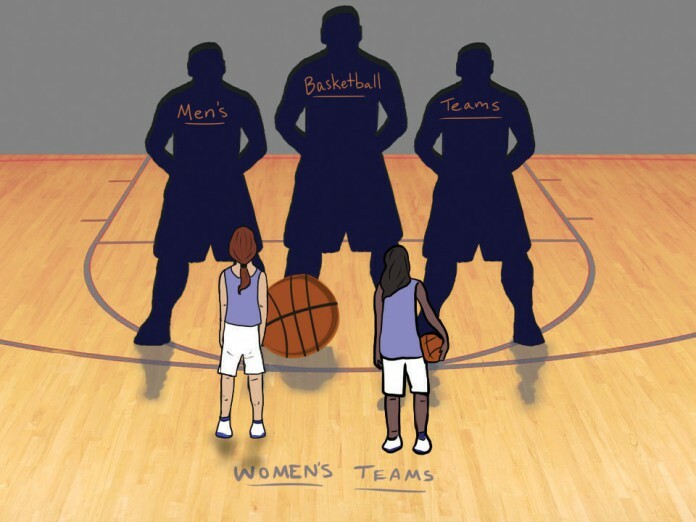 It has become easy or even trendy to mock women’s basketball in comparison to the men’s sport. Between the two professional leagues, the gap is more than just a gag. Some facts: the typical WNBA team tends to score about 20 fewer points per game than a typical NBA team, and averages about 10,000 fewer fans in attendance. Accordingly, the average NBA player makes about $5.15 million, while the average WNBA player makes about $72,000. During the off-season, many WNBA players travel overseas to continue playing, and some even get jobs in teaching when the season ends to make more money. Most sports fans write off the level of disparity to the idea that women aren’t able to play the game as well. But the men’s college game is similarly not competitive with the men’s professional game (all the perimeter shooting and zone defense do not scream athletic dominance), and yet the men’s college tournament still averages high viewership. Clearly, the interest doesn’t simply wane in the face of a perceived drop-off in quality of performance. Instead, the lack of viewership could be remedied to a degree by better marketing and promotion on the part of everyone involved. A typical commercial for the WNBA or the women’s tournament has a problem: it markets the league or the tournament themselves. But the stigmas attached to the women’s sport are so deeply rooted that the two sports simply can no longer promote themselves on their own merits. For purists, the game itself may be accessible enough to produce some fans, but the real fans will come around when there is someone to support. Even the NBA struggled with popularity in the 1970s before Magic Johnson and Larry Bird came around. Brittney Griner is known widely as a talented basketball player, but most only know this from some highlights. The WNBA needs to prop her up as a figurehead for the league while marketing other stars that may challenge her success. Narratives need to be created, and the game must become the backdrop for women ferociously climbing the mountaintop of historical success, just as the NBA markets LeBron James to fans who might otherwise never pay attention. The United States women’s national soccer team is full of famous names. One could argue the relative marketability of Hope Solo and Alex Morgan could be a result of the general public perception that they are attractive athletes. But when the lady soccer players take the field, they still play physical, hard-nosed soccer—the type that wouldn’t make well for photo-shoots—and yet people still tune in (the 2011 women’s World Cup final produced an impressive 13.5 million viewers in the United States). But the promotion of stars on the team like Abby Wambach certainly plays a part, and that is exactly the point. Call me an idealist, but I believe society can embrace women who do not necessarily fit the expectation that comes along with popular female athletes—femininity. Serena Williams is a legendary tennis player who has had her fair share of magazine spreads, but when she dominates other players on the court, there is nothing model-like in the way she tears through the court, smashing backhands like a warrior. Fans ultimately love her for the way she plays the game, but the public promotion of her gets her that opportunity. Similarly, women’s basketball needs a game-changer that will rally the world in her favor, and perhaps turn some of the jokes into admiration.